Man, did I want wings this past weekend. It was a horrible time to get a craving because grocery stores can’t keep fresh wings in stock on Super Bowl weekend. I ended up making some “boneless wings” at home with some chicken breast. The flavor was fine but boneless wings are not wings….they’re delicious chicken strips. We don’t really have a good wings restaurant in Kalamazoo. 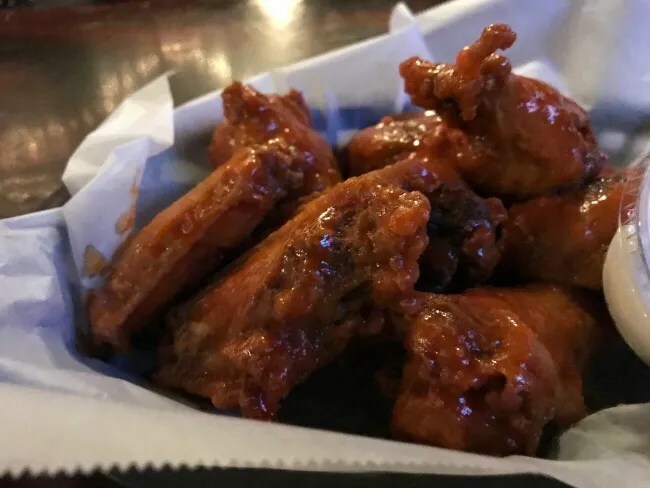 We have some bars that do really great wings but it’s not their main focus. 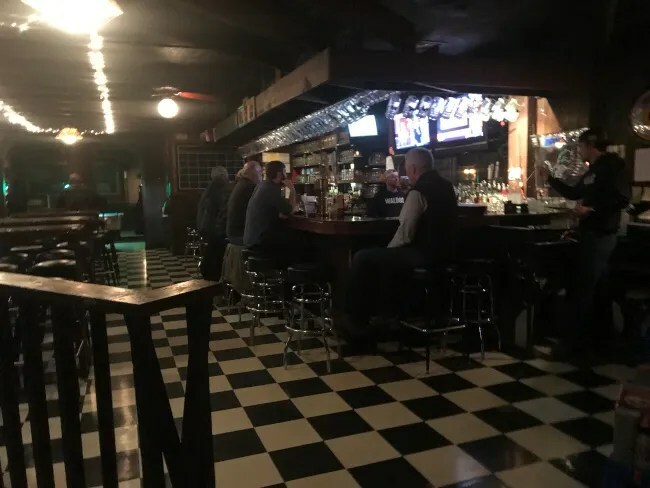 The best I’ve found so far is CJ’s Pub. Those wings are just fantastic and worth the trip to the other side of town. J is still in Florida with the kids for a quick vacation which means I’m on my own for dinner. I can go where ever I want, eat whatever I want, and not have to listen to kids whining about not wanting dinner. The wing craving was still lingering but I needed to get home after work and get a few things done so I didn’t want to go out of my way. I decided it was time for a revisit to place I haven’t been to in almost ten years. 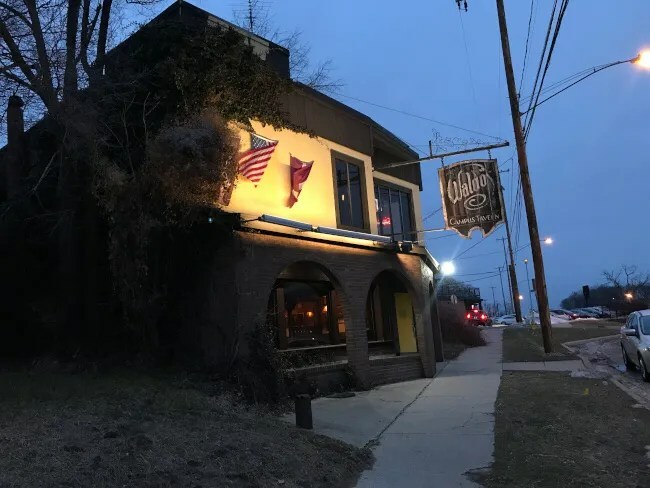 Waldo’s Campus Tavern has been a staple on West Michigan Avenue near the Western Michigan University Campus since 1982. I’m curious what this building was before Waldo’s moved in. It’s in a somewhat residential neighborhood and almost looks like it may have been a house or apartments at one time. Parking is along the street surrounding the pub. I’m sure many of the patrons walk which makes this such a great college bar. The main bar is up a flight of stairs when you walk in from Michigan Avenue. There’s a small lobby like area where a guy was sitting to check ID’s. He wasn’t there on my way in but he was on the way out. I noticed there were several families with kids eating dinner so not sure how that works with the bouncer. I had planned on just sitting at the bar but the bar was packed. This appears to be a place where people hang out after work. It was about 6:30 when I stepped in to the dimly lit pub. I scanned the bar for an open stool and couldn’t find one. The bar area is up a step from the rest of the dining room. 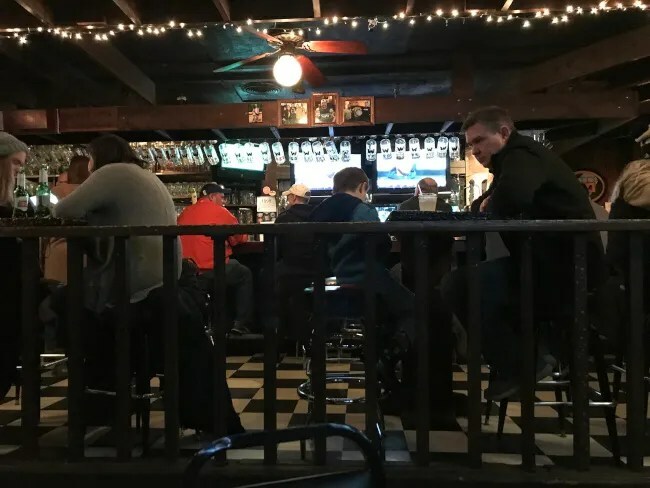 There are a few pub tables up against a railing that separates it from the lower level. All of those were full as well. The space is lit with single bulb fixtures and white Christmas lights. The floors are a checkerboard of well worn tile. 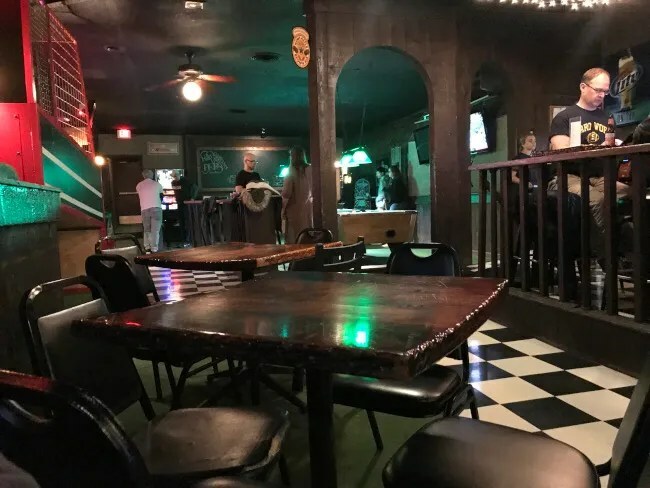 The place just has a very college town bar/dive bar feel to it. I grabbed a table somewhat near the bar and sat down. There were a number of servers hanging out by the kitchen so I just waited. One did finally come over and asked “Do you need anything?” I mean….yeah. That’s why I’m there. She didn’t offer up a beer list or a menu. I saw a Jai Alai tap when I walked in so I asked for that. If you know how that beer is pronounced, you’ll get a kick out of this. I didn’t get the Jai Alai. 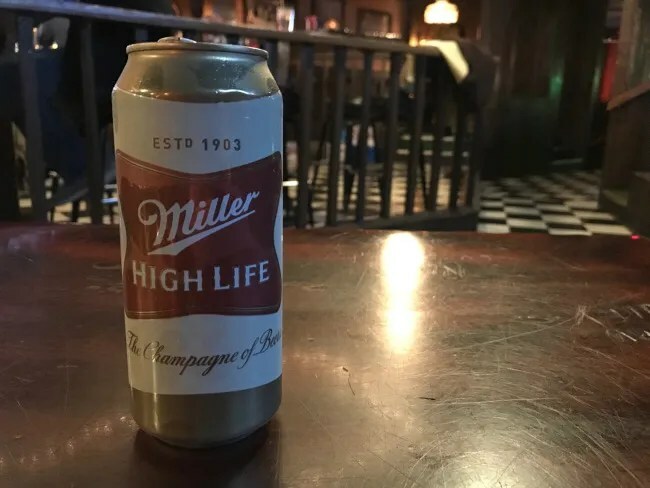 I got a High Life instead. I just chuckled to myself and took the beer. I don’t mind High Life..I don’t really like it, but I don’t mind it either so I just drank it. She set the can down and started to walk away when I asked if I could put in an order. Still, she hadn’t brought me a menu but I had it open on my phone. I asked for an order of Hot Buffalo Wings and a basket of fries. My food came in less than ten minutes. It was brought over by a different server. He set the two baskets of food down along with a big stack of napkins and asked if I needed anything else. 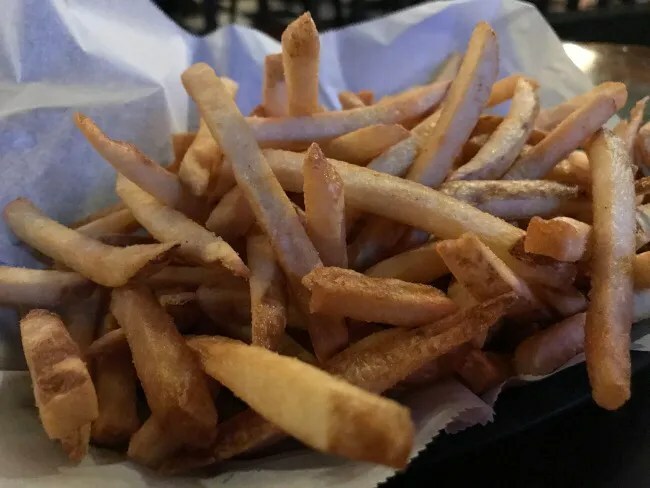 I started in on the fries because there was a lot of them. They’re simple skinny skin on fries from a bag. I dipped some of them in the sauce that was dripping off my wings but ate most of them as they were. The basket is on the shareables part of the menu and this portion size should probably be shared. I was also pretty surprised by the wings portion size. The menu doesn’t say how many are in the basket so I was pleasantly surprised when I counted ten after they were set down. The wings are big, meaty, juicy pieces of chicken. The Buffalo sauce was probably a Frank’s Red Hot base but it was really delicious. It was just hot enough to make me sweat a little but not so hot it was painful. The waitress came over once when I was about halfway done and asked if I needed anything else. I just asked for the check then. It came out to just a little over $17 before tip. 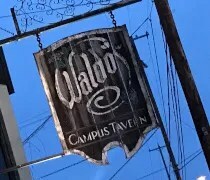 I have no idea why it’s been ten years since I’ve been to Waldo’s. The last time we were there we ate dinner before heading to a gathering across the street at University Roadhouse so I don’t think we really paid attention to what kind of place Waldo’s really is. It was kind of a quick eat and get out. I’m always up for wings and now that I realize how good Waldo’s are, it will be something I will need to remember when J asks what’s for dinner.